Pat Roe’s more than three decades with USA Funds have focused on a variety of efforts, with her most recent roles centering on philanthropy and community outreach. 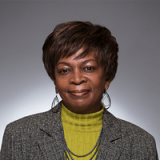 Prior to becoming senior program director, she was special assistant to the president and philanthropy manager, working with USA Funds staff and with local and national organizations to promote college success. She holds a bachelor’s degree from Indiana University.